Not so far in the distant past, this was simply a difficult-to-reach area with a few houses and a nice sand and shingle beach. Now, with the new road being extended beyond Kionia, access is much easier, and plenty more houses have been built. It’s still quiet and peaceful, however, and has lovely views across to Syros Island. 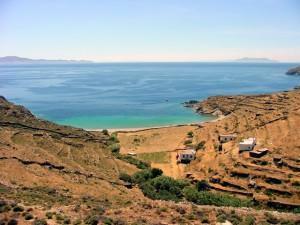 Its beach is ideal for bathers looking for a bit of solitude and access to a good taverna. Most of the homes in the area are holiday homes for residents of Tinos Town, used for vacations and weekend escapes.